In zip-top bag, combine balsamic vinegar, oil, garlic, basil, ¼ tsp. salt and pepper. Seal bag and shake to combine. Cut each sirloin steak in half. Place steaks in bag, seal and massage in marinade. Marinate steaks in refrigerator for at least 30 minutes. Meanwhile, in medium saucepan, melt butter over medium-high heat. Add onions, sugar and ¼ tsp. salt and cook for about 5 minutes. Turn down heat to medium-low and continue to cook until onions caramelize, about 10-15 minutes, stirring occasionally. Remove steaks from zip-top bag and place on preheated grill. Grill for 8 to 10 minutes or until steaks reach internal temperature of 140°F for medium rare. Carefully remove upper grill plate to expose broiler. 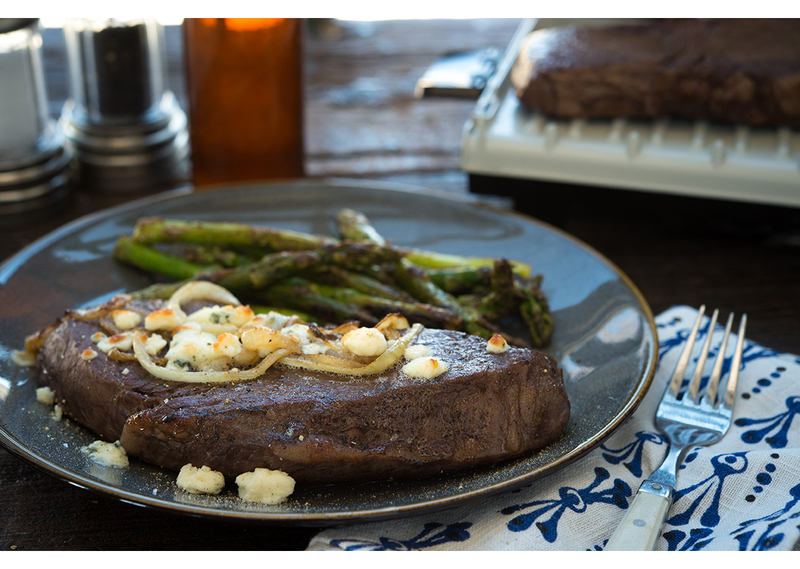 Top each steak with onions and blue cheese. Cook on HIGH Broil for 1 to 2 minutes or until cheese has softened. Repeat with remaining steaks. Remove steaks from grill and allow to rest for 5 to 10 minutes before slicing.